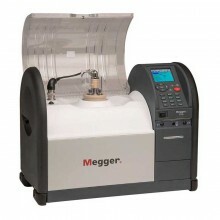 Includes: Vessel 400 ml assembly, 12V vehicle charger lead (supplied only on instruments configured with a battery), Magnetic bead stirrers (2 off), Magnetic bead retriever, Electrode gauge set 1, 2, 2.5, 2.54 mm 1002-144 and Megger OTS80PB User manual. Please Note: The price shown is for the basic build only. The final price is determined by your choice of configuration. Example configuration: OTS80PB-UK2-EP-4C = This order is for an OTS80PB with UK power lead, NiMH battery, IEC electrode set, internal printer, lid stirrer and carry bag. See PDF datasheet for details. Megger’s OTS80PB and 60PB Oil Test Sets are portable liquid dielectric breakdown testers. They are fully automatic, powered by battery/mains and facilitate accurate breakdown voltage tests on mineral, ester and silicon insulating oils. Used on site as well as in the laboratory, the precision test vessel sets the accuracy standard for the liquid insulation test industry. 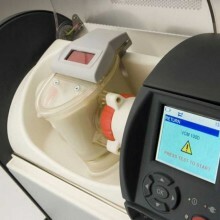 For ease of use the instruments comes pre-programmed with a ‘library’ of international breakdown test standards and the ability to create custom tests. Megger’s automatic portable oil test set OTS80PB performs accurate breakdown voltage tests on mineral, ester and silicon insulating liquids. 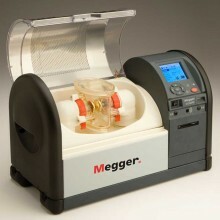 Moulded test vessels give repeatable results in the field and laboratory with lock in precision electrode gap setting adjustment wheels. The transparent, shielded lid is a key feature enabling users to see what is happening within the test chamber. The OTS80PB is line powered with the option of internal batteries (either Lead Acid, NiMH or no battery) but the OTS60PB only offers NiMH battery or no battery option. In addition to line power charging, a 12 V DC charger facility is factory fitted with either battery option. 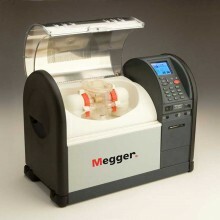 Megger portable 60 kV and 80 kV oil test sets are the lightest on the market ranging from 16 kg to 23.5 kg depending on model and configuration. They come complete with optional carry bag and transport case. Fully automatic breakdown tester with test voltages up to 80 kV / 60 kV depending on model. Advanced 400 ml oil vessel with accurate electrode gap setting and adjustment locking mechanism. Easy clean test chamber with oil drain. 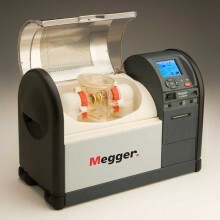 Magnetic bead stirrer or optional lid mounted impeller (conforming to ASTM D 1816). Direct trip control employing voltage and current measurement. Rapid response to trip (<10 μs). Intuitive user interface with backlit QVGA colour display (visible outdoors). Simple transfer of test results via USB flash drive. Optional VCM100D/VCM80D voltage check units measure voltage directly. Optional carry case with shoulder strap. Test Voltage 0 to 80 kV rms maximum (40 kV - 0 – 40 kV). 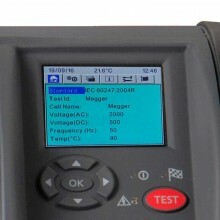 Voltage rise time 0.5 kV/s, 2.0 kV/s or 3 kV/s depending on selected test standard. Voltage rise time accuracy better than 5%. 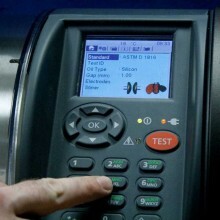 Programmed test sequences ASTM D 1816-12, BS EN 60156-96, SABS EN60156, ASTM D 1816-12E (ester oil), ASTM D 877A-13, CEI EN 60156-95, VDE0370 part 5, ASTM D 877B-13, IRAM 2341, AS1767.2.1, IEC 60156-95, UNE EN 60156, PA SEV EN60156, BS148/EN60156, NF EN 60156, JIS C 2101-99 (M), IS 6792, GOST 6581-75, JIS C 2101-99 (S), IS 6792-2 plus three custom test settings. 150 ml (superuser pack / option). Temperature measuring range 10 °C to 65 °C. Temperature sensor resolution 1 °C. 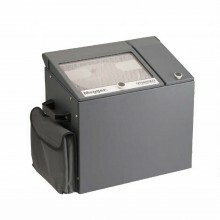 Or NiMH 24 V 2 Ah (OTS60PB or OTS80PB ONLY). 1 x USB type-B (Factory use only, or Printer). External printer Any printer with USB interface and PCL3 driver. Protection Dual safety micro switches on chamber cover. 320 x 240 QVGA colour display with backlight. Operating temperature 0 °C to +50 °C. Storage temperature -30 °C to +65 °C. Safety Designed in accordance with IEC61010. CISPR 22, CISPR 16-1 and CISPR 16-2 . Dimensions 520 mm x 380 mm x 250 mm. 20.8 kg (printer, NiMH battery). Polish, Portuguese, Russian and Swedish. 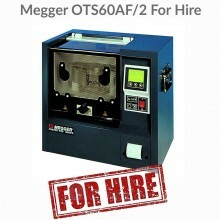 PDF Specifications of the Megger OTS60AF, OTS80AF & OTS100AF Laboratory Oil Testers.